Vitamin E, alpha-tocoferol, is a liposoluble vitamin and occurs by nature in vegetable oils and cereal sprouts. In dermatology, following application it supports hydration, suppleness and creaminess of the skin. All its effects relate to an antioxidative activity – the ability to neutralize free radicals originating as a consequence of various radiations and chemical or other undesirable influences of the environment. When applied on the skin, vitamin E protects skin cells from damage, slows down the ageing, and supports elasticity, creaminess of the skin and youngness of the complexion. 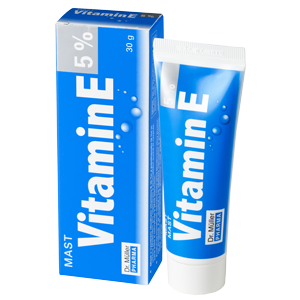 The cream with increased content of natural vitamin E and panthenol is designed for regular everyday care for the skin. Owing to the content of active substances it cares for the dry skin stressed by sun radiation. 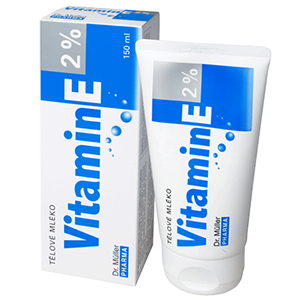 Body milk with an increased content of natural vitamin E and panthenol cares finely for the whole body skin after bath. It moistens the skin perfectly and keeps it soft and smooth. 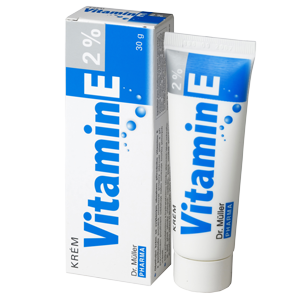 Ointment with high content of vitamin E (5 %) and panthenol (2 %) is designed especially for greasing of dry or chapped skin. Owing to the content of active substances it keeps the skin fine and soft.